Illamasqua has just released a new collection this week in time for the northern Autum/Winter season known as the Theatre of the Nameless that draws inspirations from the riotious and pleasure seeking scenes during the nocturnal underworld subcultures during 1920s in Berlin (this sort of reminds me of Underbelly Razor show with the working girl references). I'll talk more about the launch another time on but for now, I just want to show you the nail varnish from the collection that is both opulent and exuding in confidence. Taint is a cool stone brown shade. In some lights it looks like a deep grey brown. I was initially unsure of the shade, especially in the bottle, thinking it might be too muddy on fingers but boy was I wrong. This shade is rich and broody and being a strong opaque shade, it exudes strength, confidence and edginess. Yes - I will admit to quite liking it on my nails. It's also boasts a chip resistance formula that is quick drying and streak free for very easy application, even for clumsy people like me who have difficulties at times with getting even finishes. Taint dries to a beautiful satin matte finish that is described as having a rubber finish which feels flat and smooth, one of the best matte finishes I've tried as they can sometimes feel 'rough'. This deceptive shade has completely won me over and is a great colour with denim or for the cooler months and even though it's now Spring in Australia, Melbourne is in the grips of a cold front this week. So what do you think of Taint? Would it be a shade you would sport on your digits? RRP A$34 from Myer Sydney City, Melbourne City, Brisbane City, Robina and Bondi Junction and Myer online. 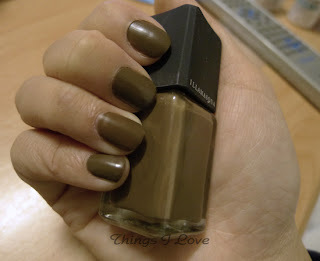 Thanks MsMadamMakeup - it isn't flat mater, more a satin matte which I'm really loving!